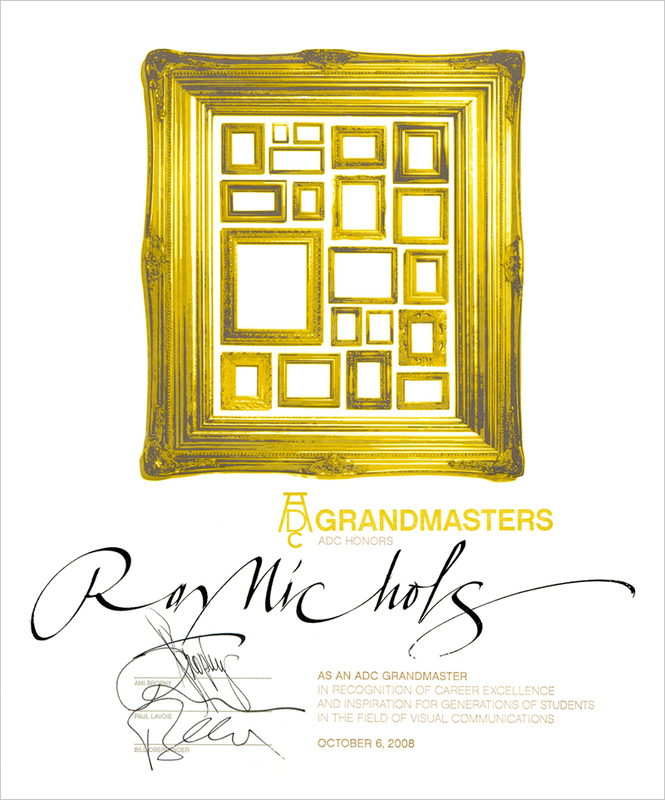 On October 5, 2008 I had the honor of being awarded the title of Grandmaster by The Art Directors Club of New York. The ADC initiated the award to highlight people in the design education field. The ADCNY describes the ADC Grandmasters as educators whose teaching careers and mentoring have impacted generations of students and whose legacy is a far-reaching network of industry leaders and professionals in advertising and design. 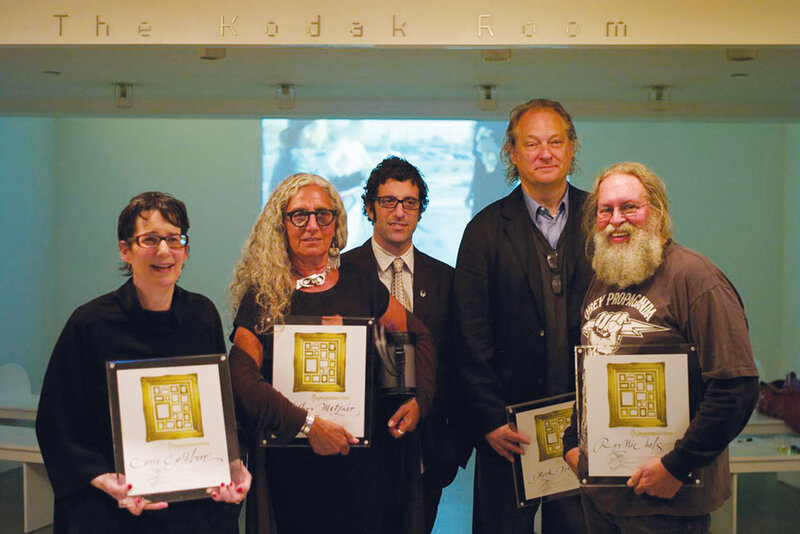 The winners (holding certificates) : Carin Goldberg (School of Visual Arts), Shiela Metzner (School of Visual Arts), Mark Fenske (AdCenter / Virginia Commonwealth University), & Ray Nichols (University of Delaware). Sheila Levrant de Bretteville (Yale University), had to leave early and wasn’t there for the photo. The award is a great honor in itself and to be included with these important teachers from such important schools was the cherry on top. I’ve been blessed with the opportunity of working with a lot of great students who worked hard, stood up well under the assault of critiques and all-nighters, and opened their minds to creative possibilities. While I had a great time in VC, I envied every student when they graduated, often wishing I could change places. Rick Boyko, director of VCU / Brand Center), who was supposed to introduce me couldn’t come, so they switched it to Nancy Miller Vonk (VC’79) who had some wonderful things to say and that made it so much more wonderful and personal. Maybe as many as 100 graduates attended the celebration or joined us afterwards at the Black Door. It was great to see both graphic design and advertising design graduates there, as I had only chosen from my advertising design graduates to be in the show, along with a sizable number of younger graduates. It was an astounding feeling seeing graduates spread over 25 years meeting each other, many for the first time. Two of the graduates, Ellen Steinberg (’90) and Nancy Miller Vonk (’79) said they had been emailing each other for two years and only were aware that they had me in common when I sent a note listing who was included in the exhibition. Graduates came from a lot of places, including San Francisco (2), Boulder, CO (2), Chicago, and Toronto. 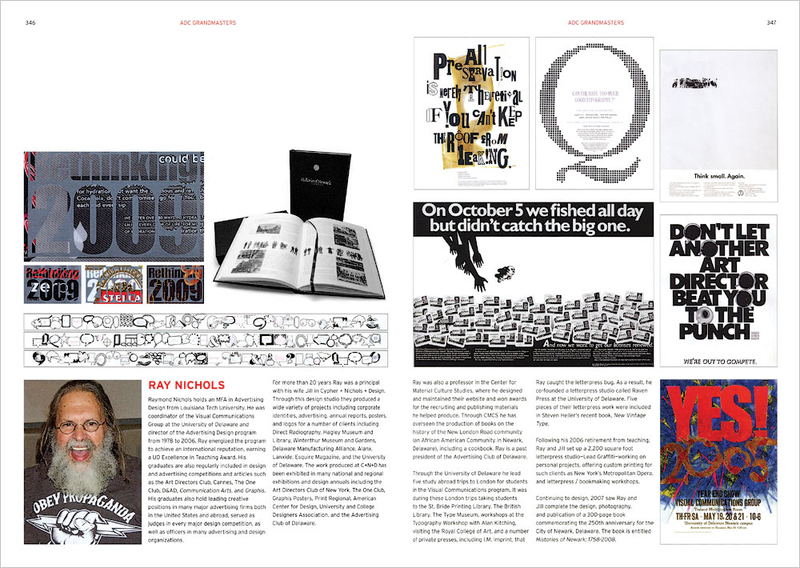 The photo at the top shows a spread devoted to work I was connected to from the 88th Art Directors Club of New York annual which announced the inaugural awarding of the title of Grandmasters to design instructors. At this point I had retired and had quit adding the books to my collection. I was Googling something and the article suddenly appeared. I looked up the book on Abebooks.com and there were copies easily available, so I bought two of them—one was for DCAD, who received a good number of the design books from my library, and the other was for Lead Graffiti’s library. I thought I would share the wonderful page designed for ADC88 back in 2009. Nine of my absolute favorite projects through 2008, along with one of my favorite portraits, were shown on the double-page spread. Truly a great honor. Rethinking 2009 — This New Years card was the first notion we had of doing our Boxcards using recycled boxes as the stock. Histories of Newark: 1758 - 2008 — A 300-page hardback which we designed. We took hundreds of photos for the book, most notably the “citizens band” that runs through every page and includes more than 3,700 townspeople. All preservation is merely theoretical if you can’t keep the roof from leaking broadside for the American Printing History Association’s national conference at Columbia University. A copy was given to every attendee. The type is from our orphan wood type collection. Can you have too much good typography — The broadside celebrated a visit and talk by Justin Howes from London about his digitizing Caslon from original printings. The image is a single piece of 18″ x 24″ wood type that we made for the poster. Yes 2005 — broadside printed via letterpress for a Visual Communications year-end exhibition. There are 11 pieces cut with a laser from a 1/4″ sheet of Plexiglas. The whole world is talking — The 3 versions of an 8-foot poster silkscreened in 2′ segments of voice bubbles for a Visual Communications year-end exhibition. Printed on a roll of paper 0.7 of a mile long. The stacked posters were handcut using X-acto knives (total length was 2.8 miles). There were 36,000 rubber-stamp impressions. Yes, it was a job, but a killer piece that won us a bunch of design awards with nods from people like Ivan Chermayeff, Helmut Krone, and Milton Glaser. 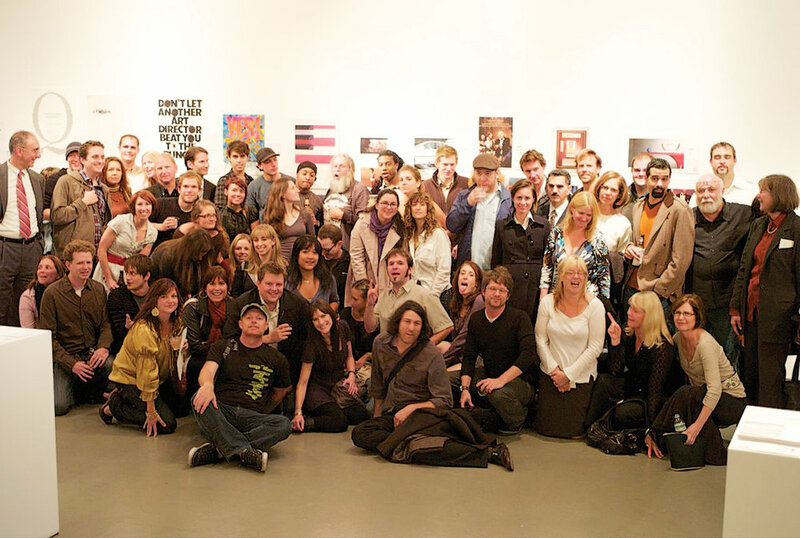 The following creative directors, art directors, copywriters, and photographers were chosen to represent that “far reaching network of students” which were included in the exhibition. We were asked to letterpress the certificates for the Art Directors Club of New York Grandmasters Award ceremony held in October, 2008. The Club is an important organization for those of us in the design field and it didn’t hurt that Ray was getting one of the awards. Below is the award. The original photo was from the Craig Cutler Studio. Terre Nichols (VC’88) deserves a lot of the credit for the original idea development of the award, along with Bill Oberlander, former President of the ADCNY, who brought the project into the light. The the original image for the certificate was photographed by Craig Cutler Photography (VC’83) and provided to us by the designer of the certificate, Lizzy Ferraro (VC’05). The signatures were executed in ink by Satwinder Sehmi, a constant for almost 20 years of VCUK trips. The signatures were scaned and then printed via letterpress. It was a family project, for sure. Tray Nichols (VC’95) posterized the image in four tonal stages (#1 was the lightest to #4) to capture the dimension and detail using Illustrator and Livetrace. Ray was in charge of the printing and some serious resolution issues. Jill was the ink mixing master. ⬆ Former VC students who shared the evening at the Grandmasters ceremony. Everyone of those represents a nice moment in my life and reminds me how good a run I had with a bunch of amazing students, colleagues, friends, and design professionals. 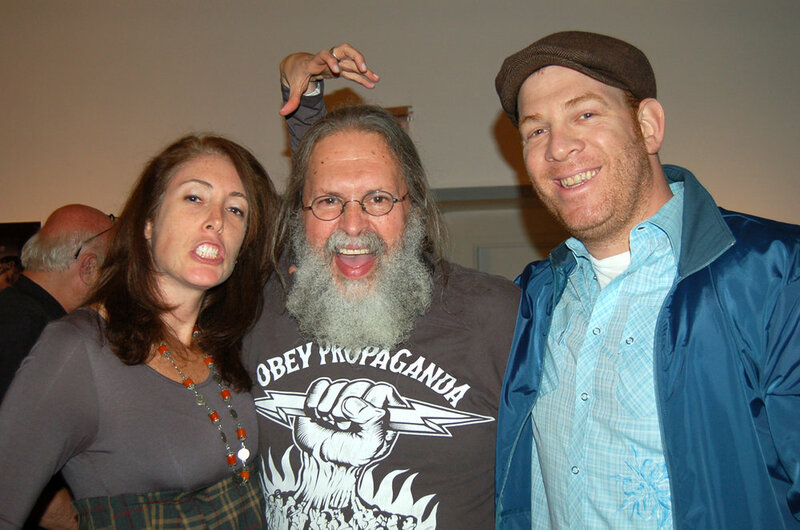 Robyn Stern (’94), Ray Nichols, and Dave Laden (’95). I thought the T-shirt made a nice statement about the evening and was the source image for one of my favorite portraits ever. When starting the printing we had purchased PMS871 ink which is listed as the lightest metallic yellow-gold. In our experience, it is much darker and appears more like bronze with a heavy patina. We cleaned the press, added gold powder. Nope. Cleaned the press and then tried adding base tint. Nope. We decided to go back and start with yellow and build the image in color without worrying about the metalflake issue. The first run of plate #2 looked OK, but it is also hard to tell where you are going with this kind of image after one run. So, we printed plate #3 to see a bit more of the image. The overall quality was better working from a base of yellow, but still lacked some snap. So we printed plate #4 followed up by #1. The image was still just OK and still without the snap of the reflective gold in the original image. So we put plate #2 back on and ran yellow with a bit of base tint to help the first run show through. An additional problem at this point was that we had cut off the registration marks (we were being cheap, not wanting to pay for all that blank area of the 10″ x 12″ certificate) so getting the registration aligned was much harder the second time. The second layer of yellow helped a lot. Then we did the same thing with #3 (same issue of having removed the registration marks) and we had an image that was pretty accurate to the original. It had taken us 6 letterpress runs spread over two days. After three more runs (logo, text, and calligraphy), the resulting certificate (below) came remarkably close to the original. We love showing it to letterpress printers. They always run their fingers over the name and ohhhh. We say, “No. Run your fingers over the frames.” They cannot believe it is letterpress. It is worth mentioning the importance of a few colleagues in our program that contributed in very important ways to my own successes, both inside and outside of class, including Bill Deering, Martha Carothers, and Hendrik-Jan Francke. And then there is Jill Cypher. Anyone who knows me knows how important she is to me and any successes I can claim.